Not only is a manicure great for making your hands and nails look their best, but regular manicures will enhance the health of your fingernails, promote strong and faster nail growth and maintain well moisturised cuticles, avoiding those painful hangnails. My manicures will clean and shape your nails and treat your cuticles, which is vital for keeping your nails healthy and strong. In the deluxe manicure, your hands will be exfoliated to remove dead skin cells, improve circulation and stimulate blood flow. A hand mask will also be applied, making your hands super soft and smooth. I use a range of polishes by CND Vinylux. If you haven't heard of it, Vinylux Weekly Polish is a breakthrough polish that endures a week of perfection... without a base coat! Exposure to natural light activates the patent-pending ProLight Technology to deliver week-long wear. While ordinary polishes break down over time, Vinylux actually becomes more durable! How amazing is that!! 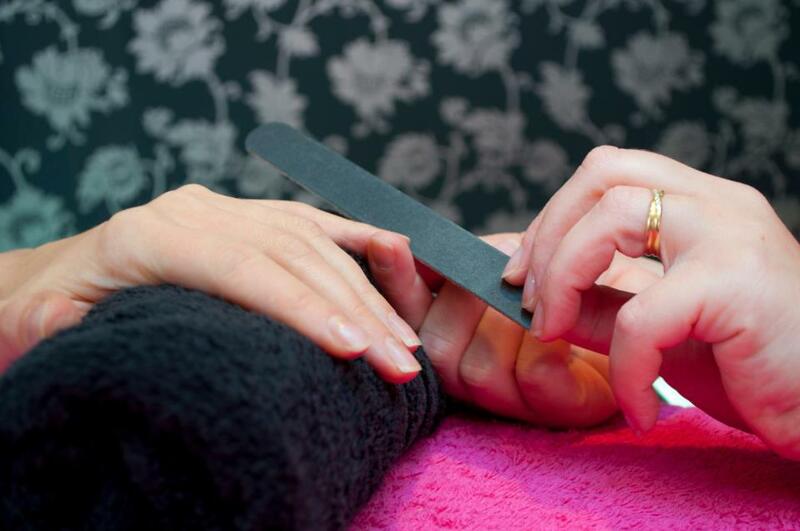 All manicures include Vinylux polish or upgrade to Shellac for longer lasting colour. Feet are usually one of the most neglected parts of our bodies and often get left off our regular beauty regime. However, you are on your feet everyday so they do need some TLC! In my pedicures, your nails will be filed and trimmed to prevent ingrown toenails. The exfoliating and massage elements can relieve aching feet and muscles and stimulate circulation. The oils and moisturising elements will keep feet well hydrated and prevent dry cracked heels, which can be painful and unsightly. All pedicures include CND Vinylux polish or upgrade to Shellac for longer lasting colour. *Paraffin wax is a luxurious warm liquid mask dating back to the roman empire. It is deeply nourishing, moisturising and has a softening, smoothing and plumping effect making fine lines disappear. It also increases blood circulation encouraging cell renewal. It really leaves your skin baby soft and glowing. This treatment is particularly good for those suffering with arthritis. With technology that combines the ease of polish with the performance of gels, Shellac boasts 14+ days of colour, no chipping, a high gloss shine and is instantly dry. It will not damage your own nails and can be removed in 20 minutes. With lots of colours to choose from, what’s not to love! !